Thank you for everything!!! 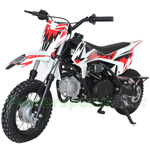 Top notch quality, I bought the DB-X31 Pro, awesome dirt bike. For the price, around $500 with delivery, this beats a Honda,Suzuki for around $1,000 for same bike pretty much any day. I bought a blue one for my kid, he loves it. It is perfect setup for graduating young riders to manual later on. I recommend it ! I've had the bike for several days now and the bike is awesome so far. Got for my son for Christmas and we love it! The service I received was top notch, as was the bike I purchased. An awesome little bike for the price--the perfect way to introduce my kids to motor sports! It took only a few minutes to put together, out of the box--I was nervous it would require a lot of mechanical know how to put together, but it's seriously put the handlebars on and then add gas and you're ready to go!